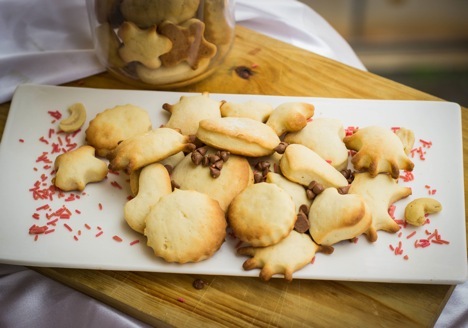 As the winter sets in, few things are more comforting than the smell of freshly baked biscuits. Christmas is still a month away but it is already winter in Russia. Many regions are slowly getting covered with snow. The coldest part of the winter is just around the corner, with days becoming shorter and nights longer. India is still warm but places like Delhi and Kashmir already getting the chilled air in the evenings. Even Bangalore is not as warm at nights as it was before. When it is cold outside there is nothing more comforting than smell of freshly baked cookies. The recipe that I have chosen is very simple. Anybody can make them. You will require the shaping forms to cut the cookies. If you don't have them, use different sized glasses to make various round shaped cookies or just cut into squares. Baking powder 1.5 tea sp. 1. Sift maida and mix with baking powder. 2. Mix eggs with sugar and vanilla and thoroughly whisk. 3. Add melted butter and mix. 4. Add set curd and mix one more time. 5. Slowly add maida with baking powder to the mixture and mix the dough which should be quite soft but not sticky. If it is still sticky, add more flour to bring it to the right consistency. Make a big ball out of it, put on the plate, cover with plastic wrap and keep it in the fridge for 2-3 hours. 6. Roll the ready dough into flat sheets on the table with about 1/4 to 1/3 of an inch thickness. Cut into desired shapes with a form or with a glass or just cut into diamond or square shape with a knife. 7. Bake for 15-20 minutes at 180C depending on the thickness. Decorate ready cookies by sprinkling with sugar powder or just leave the way it is.